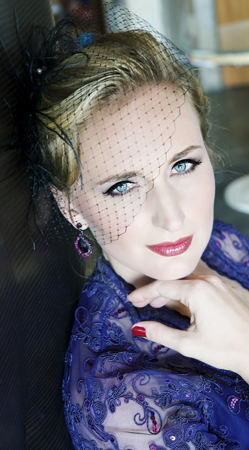 Whether in opera or on the concert stage, Hungarian mezzo-soprano Agnes Vojtko has established herself as a versatile and genuine artist. It is largely her musical formation what has put her dynamic profile in the international spotlight. She completed a bachelor degree in music at the prestigious Franz Liszt Academy in Budapest. Later, she moved to the United States as a Fulbright fellow to attend the Butler School of Music of The University of Texas at Austin, where she obtained the degree of Doctor in Musical Arts. Her vocal flexibility and magnetic dramatic presence are, therefore, infused with the best from the Austro-Hungarian tradition and her American music training. In 2006, Agnes made her opera debut to critical acclaim with Opera in the Heights's production of Norma as Adalgisa. The Houston press raved, calling her performance “a revelation”. Either “pouring out Adalgisa's legato remorse or scaling the heights in 'Mira, O Norma'... she's a force to be reckoned with.” She has also appeared in Austin Lyric Opera's Madame Butterfly as Ms. Pinkerton, and in several productions of the Sarah and Ernest Butler Opera Center, which include Menotti's The Medium (as Mrs. Nolan), Puccini's Suor Angelica (as La Badessa), the American Premiere of Luis Jaime Cortez's La Tentación de San Antonio (as Helena), Tchaikovsky's Eugene Onegin (as Olga), and Peter Brook's La Tragédie de Carmen (as Carmen), for which she was nominated for an Austin Critics Table Award. It is because of her “rich voice” (The Austin Chronicle) that Agnes delves into these roles with natural ease and grace. Meanwhile, her scholarly approach to earlier repertoire shows the span of her vocal versatility. She has sung with the Ars Classica Chamber Opera as Fidalma in Cimarosa's The Secret Marriage, as Second Lady in Mozart's The Magic Flute, as Cherubino in The Marriage of Figaro, as Zerlina in Don Giovanni, as well as Proserpina in L'Orfeo with the Budapest Chamber Opera, and as Nerone in L'incoronazione di Poppea with the Sarah and Ernest Butler Opera Center. Recent highlights of her solo concert activity also include Mahler's Songs of the Wayfarer, Donald Crockett's The Cinnamon Peeler, and Mozart's Mass in C Minor.